Panthaka (Skt. ; Tib. ལམ་ཆེན་བསྟན་, Lamchenten; Wyl. lam chen bstan) — one of the Sixteen Arhats. 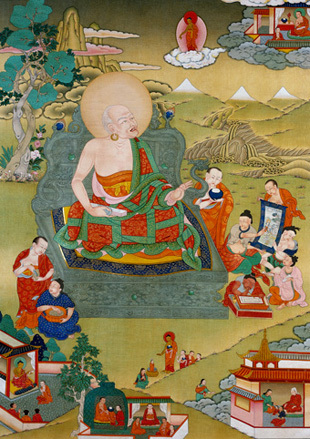 Panthaka is the elder brother of Chulapanthaka, the eleventh of the Sixteen Arhats. He was an accomplished scholar with hundreds of students. After listening to a monk explain the Buddha's teaching of interdependent origination he sought ordination, studied and meditated on the teachings and attained the level of arhat. He then taught the Dharma widely. He dwells in the Heaven of the Thirty-Three together with 900 arhats. With his left hand in a teaching mudra and his right carrying a book, he aids those who earnestly wish to study, practise and meditate on the Buddha’s teachings.